I need to give this stuff a try. Sounds interesting. I’ve lifted this from the Epicurious blog feed. America is the land of DIYers and our founding fathers were no exception. 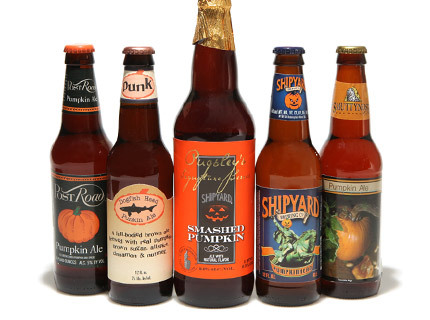 George Washington, Ben Franklin, and Thomas Jefferson are all said to have brewed beer from pumpkins. They had to: Barley and other ingredients used to make liquor in the Old World were scarce in America. So settlers used whatever they could get their hands on, including parsnips, molasses, squash, corn, and apples. (This also explains why applejack brandy was so popular back in the old days.) But truth be told, the craze for pumpkin beers didn’t really take off until the late 20th century, when craft brewers started playing with the genre. What exactly is in pumpkin ale? Brewers can hand-cut (and roast) pumpkins and leave them in the mash as it ferments, or add pumpkin puree or even artificial pumpkin flavorings. Most breweries also add spices such as nutmeg, ginger, clove, allspice, and cinnamon. Note: No one makes pumpkin beer exclusively out of pumpkin any more. For a palatable beverage, you also need malt, hops, yeast, and water. Expect average potency: 5-6% ABV. And for those wonder: Is it always pumpkin ale? The answer is no. Though rare, beer makers have experimented with other beer styles. Witness: Lakefront Pumpkin Lager, Four Peaks Pumpkin Porter, and Fisherman’s Pumpkin Stout. What does it taste like? Some pumpkin beers feature subtle hints of the squash. Those are the good ones. Others taste like boozy pumpkin pie, often too sweet, cloying, and rich. The vast majority of companies play up the pumpkin-friendly spices more than anything else: cinnamon, nutmeg, allspice, clove, caramel, and ginger. Tasters may also detect notes of molasses, caramel, earthiness, and hazelnut.